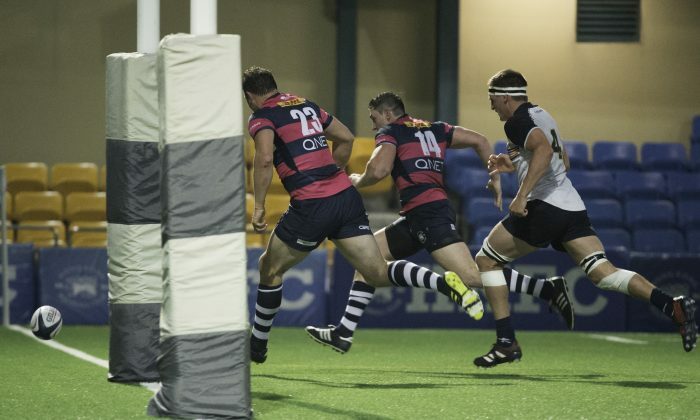 HONG KONG—Nataxis Hong Kong Football Club produced an assured display on Saturday to beat Herbert Smith Freehills Hong Kong Cricket Club 50-7, and move back to the top of the Hong Kong Men’s Premiership. The result was never in doubt. Despite a slow start by Club, there was always a sense the speed and line running of Club would expose the HKCC defense, which this season has been porous. 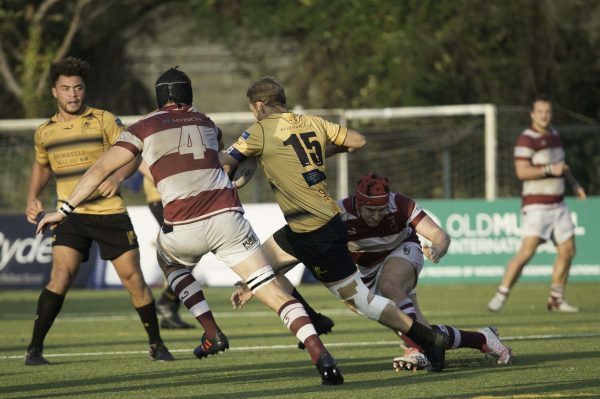 After 12minutes, Club scrumhalf, Jamie Lauder, broke from the base of the scrum, and was too quick for HKCC, and put the first points on the board for Club. Fullback Glyn Hughes converted, and Club led 7-0. After 21 minutes, Hughes added a penalty goal for Club, to edge the score to 10-0, and settle the team. Play from both sides had been scrappy. A lot of dropped ball, wayward passing, and running across the pitch without much forward penetration. That changed on 26minutes, a line break by Club’s powerful winger Marno Meyer, chipped the ball forward for Hughes to run onto, gather and touch down under the posts, then calmly convert. HKFC now led 17-0. On the stroke of halftime, a similar kick and chase, saw Club winger, Charlie Higson-Smith outsprint his teammates, collect the ball and score Clubs third try; again, converted by Hughes. By halftime Club was comfortably ahead 24-0. The second-half reconfirmed Clubs dominance. Despite HKCC’s gallant defending, Club was too quick and skilled with the ball, especially at flyhalf (Nate de Theirry) and scrumhalf (Jamie Lauder). They injected pace into the game, to stretch the HKCC defense and create openings to enable substitute Club winger, Josh Birch run in three tries in the half, plus another for Hughes. However, it was HKCC who had the final say of the match. HKCC may have been outclassed, but they never gave up. Their efforts were rewarded with a try at the final whistle by flyhalf, Angus Cameron, converted by scrumhalf Jack Metters, to give a little respectability to the scoreboard. The bonus point win for Club returned them to the top of the league, and they look favourites for the Championship. 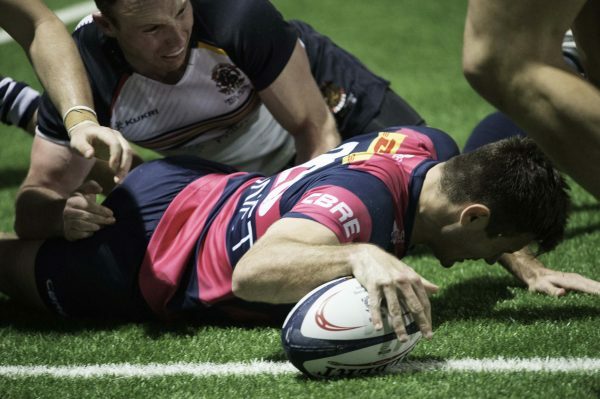 Their close rivals, Borrelli Walsh USRC Tigers narrowly beat Kowloon 20-16, with a last gasp try, but trail Club due to an inferior points difference. In the other game, Bloomberg Hong Kong Scottish, despite home advantage at the Rock failed again to beat Société Générale Valley, losing 20-23. After 12matches, Club top the league (on points difference) with 43points, followed by Tigers also on 43; Valley third with 38; Scottish with 30, Kowloon 23, and HKCC with 7 points and definitely confirmed for the ‘wooden spoon’. Grahame Carder is a sports enthusiast, former player and resident in Hong Kong.